RIT baseball won its first Liberty League Championship and advanced to the NCAA Tournament for the first time last spring. Baseball was one of four sports that won the Liberty League for the first time last school year. Thereâ€™s a long list of accolades for all 24 varsity sports. Amy Reed admits that her first year as coach of the RIT women’s basketball team was trying. When she started a decade ago, the team had had only one winning season since 1987. On top of that, she only had seven players. “It was a real struggle,” said Reed, who played Division I basketball for Marshall University and had worked as the assistant basketball coach at Gettysburg College for one season before coming to RIT. Her struggle was rewarded last season when women’s basketball won the Liberty League Championship and advanced to the NCAA Tournament—the first time in program history. And the team wasn’t alone. 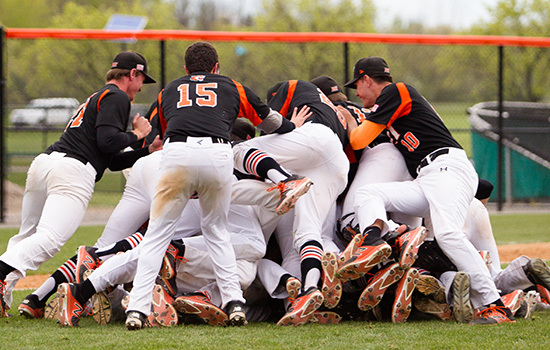 RIT baseball also won its first Liberty League Championship and advanced to the NCAA Tournament for the first time. Women’s track and field won its first Liberty League Indoor Championship. Women’s crew won its first Liberty League Championship last spring and made its first NCAA appearance. And those are just the firsts. There’s a long list of accolades for all 24 varsity sports, including that RIT’s student-athletes earned the highest cumulative GPA in program history with a 3.32. Lou Spiotti Jr., executive director of Intercollegiate Athletics, said the rise of RIT athletics is a remarkable story but not unexpected given the growth and advancement of RIT, notably RIT’s transition to a research university. He attributes the recent success to a multitude of factors, including the support of RIT’s leadership, the success of the men’s and women’s Division I hockey teams, the move of Division III sports to the Liberty League, the nationally ranked men’s lacrosse team, strong coaches, a supportive environment and outstanding student-athletes who go on to be leaders after graduation. Spiotti said he expects this upswing to continue this academic year and beyond. Spiotti would certainly know. He came to RIT in 1974 as RIT’s football coach, replacing Tom Coughlin—the same Tom Coughlin who went on to lead the New York Giants to two Super Bowl wins. At that time, there wasn’t as much school spirit surrounding sports, remembers Spiotti. And there were only half the number of sports that there are today. Spiotti said RIT’s presidents over time played a big role in developing athletics. M. Richard Rose, who assumed the presidency in 1979, recognized that athletics was a way to serve students as well as a catalyst to school spirit. He acknowledged that athletics could serve as an extension to the greater Rochester community. Hockey became the beacon, with men’s soccer and men’s lacrosse becoming perennial powers as well. The 1982-83 season marked a milestone in the men’s hockey program, as the Tigers won their first NCAA Championship in Division II. A second championship came two years later at the Division III level. “That’s when everything started coming together,” said Spiotti, who became athletic director in 1980; football was cut in 1977. Spiotti said each RIT president since has helped elevate athletics. Bill Destler championed RIT’s Division III sports leaving the Empire 8 Conference and joining the academically aligned Liberty League, which includes universities such as Rensselaer Polytechnic Institute, Clarkson University and St. Lawrence University. 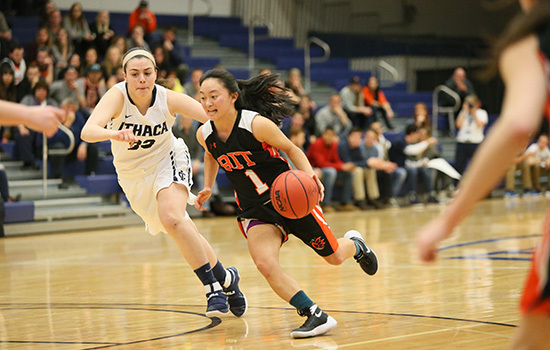 Spiotti said RIT made a full-court press to join the league and Destler led the charge. League officials wanted to know RIT’s commitment to athletics. Would RIT make part-time coaches full time and invest in facilities? Would women’s sports be strengthened? “Our advantage was that we not only had a terrific athletic program but a highly reputable academic institution,” Spiotti said. Destler and the presentation team made a strong case and RIT was accepted for the 2011-12 academic year. RIT enjoyed immediate success. Men’s indoor track and field was the first Liberty League champion that winter while men’s lacrosse won the first of its six straight league titles. Men’s lacrosse went on to play for the 2013 and 2017 national championships. The Liberty League has certainly been a different ball game for RIT baseball and head coach Rob Grow ’88 (business). Grow would work his day job as a buyer at Xerox Corp. in Webster, N.Y., and then drive to RIT to run evening practices. He did that for a dozen years before he got a job on campus as director for Alumni Relations affinity groups. 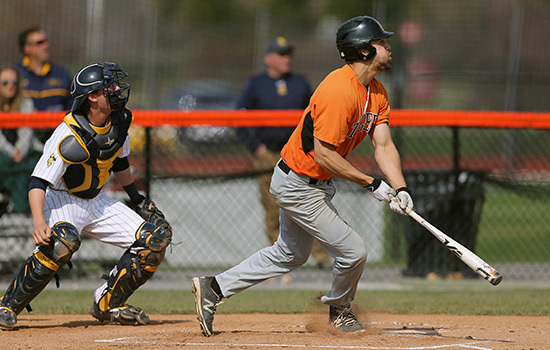 Being on campus helped eliminate the driving time, but Grow still didn’t have time to develop relationships with high school coaches and find those high school baseball players who were the right fit for RIT. Upon joining the Liberty League, Grow became a full-time coach, as did coaches for men’s soccer, women’s soccer, softball and women’s lacrosse. Five years out, RIT is seeing a difference. Grow has been able to expand his recruiting efforts into Ohio, Pennsylvania and New Jersey and visit recruits in their hometowns. Grow uses Will Gorman as an example. Gorman, an outfielder who set RIT single season records for home runs and runs scored, was drafted on June 14 in the 32nd round by the Arizona Diamondbacks and made his professional debut the following month. He also has a grade point average of 3.55 in chemical engineering. Gorman said he has played baseball since he was a child growing up in the Albany, N.Y., area, but he was under the radar for most college coaches. Grow spotted him at a showcase in Rochester. He picked RIT because of the strong academics. He had no idea that four years later engineering would become his backup career. He plans to finish his five-year degree next fall after taking the spring semester off to start his second season of professional baseball. Gorman and the rest of the baseball team enjoyed their strongest season in program history last spring, making their first NCAA Division III Baseball Championship appearance after winning the Liberty League Championship. Phillip Ferranti Jr. ’79 (business administration), who played baseball from 1975 to 1979, was there to watch. Ferranti has been a supporter of RIT baseball since he graduated. He also is a member of the RIT Athletics Hall of Fame. “The Liberty League title was great but making the NCAAs was even sweeter,” said Ferranti, who helped lead the Tigers to three Eastern College Athletic Conference finals, including a championship in 1977. But his teams never made the NCAA Tournament. Sandra Johnson, senior vice president for Student Affairs, said not only are athletics at RIT getting stronger, but student-athletes are doing remarkable things. Amy Guthrie ’18 (electrical engineering) and Sarah Szybist ’17 (biomedical sciences) are two examples of that. Guthrie earned the first RIT women’s crew All-America honor in program history last spring, along with helping her team win its first Liberty League Championship and a fifth-place finish at the national championships. 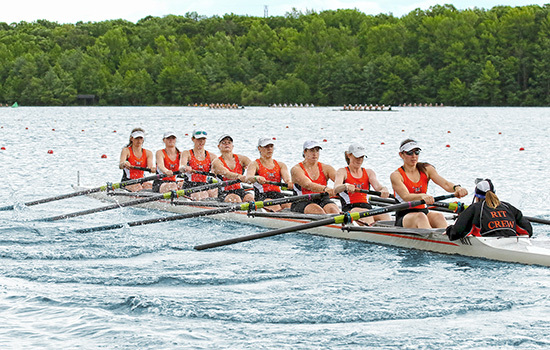 Guthrie, who sat stroke seat for the varsity eight, had never even tried rowing when she started at RIT but a friend as well as a rower both convinced her to try the sport. She joined freshman year and liked the challenge. Guthrie has completed her athletics eligibility but has one year left of school. Over the summer she did an internship with the Johns Hopkins University Applied Physics Laboratory. She received a full-time job offer and will return to work there after she graduates. Szybist was named the 2016 COSIDA Academic All-America of the Year for Division III Women’s Volleyball. Szybist is the second RIT student-athlete to receive the honor, joining volleyball player and RIT Athletics Hall of Famer Ushi Patel ’00, ’01 (printing management, MBA), who received it in 1999. 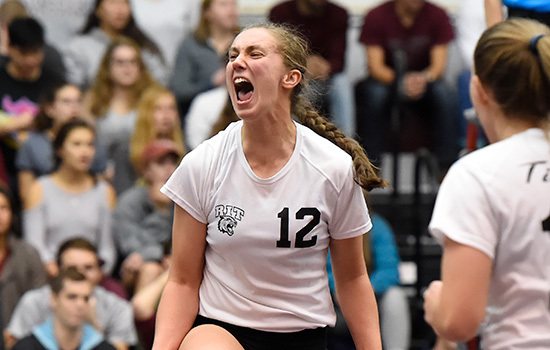 Szybist, who had a 3.94 grade point average, led all of Division III during her senior season with 770 kills and finished her four-year career with 2,563 kills, which is sixth all-time in NCAA Division III history. She is now in medical school at Rocky Vista University, College of Osteopathic Medicine. Szybist said she picked RIT because her coach emphasized the importance of academics as well as athletics. Her choice is paying off in medical school. “I’m sitting in some of my classes and I am so glad I took this course with this professor because it’s all review right now,” she said. Szybist said one reason she was successful is because academics was valued by all the members of her team, who would do homework in between games and on road trips. Spiotti, too, is excited for the future. RIT’s new president, David Munson, has already talked about the importance of athletics attracting top students to RIT. Spiotti said facilities such as the Gene Polisseni Center, the new home for men’s and women’s hockey that opened in 2014, have become a source of pride for all athletes. Renovated locker rooms for other sports, including the new Ronald S. Ricotta Wrestling Locker Room that opened last February, are better than some Division I sports. A part-time strength and conditioning coach, who started in the 2015-16 season, has also made measurable improvements for athletes. But maintaining a program that is consistently in the top 10 to 20 percent of the nation requires resources, including full-time assistant coaches, athletic trainers and support staff, he said. It requires continuing to hold both athletes and coaches to very high standards on the field and especially in the classroom, Spiotti said. And it requires the integration of all athletes. One way that happens is through Tiger Den events, sponsored by the RIT Student Athlete Advisory Committee. This is where each team picks one game per season for all student-athletes to attend. Grow said athletes today support one another much more than they did when he was a student-athlete. His baseball team, for example, stopped practice and watched the women’s basketball team win the Liberty League Championship. Another Liberty League championship is the goal this year and in the coming years for both teams. Strong seasons, combined with RIT’s top academics, will help Reed continue to build her program. Now she can sell both sides of the university, adding that every player she has coached in 10 years has had a job after graduation. That’s why Cori Okada, a junior majoring in electrical engineering from Fullerton, Calif., picked RIT. Okada moved thousands of miles away from home because of the strong engineering and co-op programs. Basketball has been a bonus—a very sweet gift for the point guard.